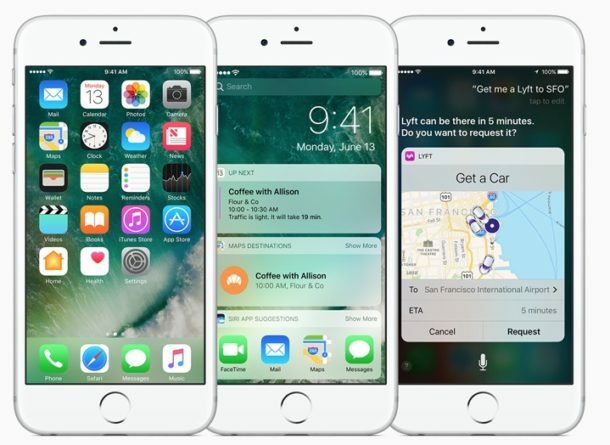 Apple has released iOS 10.0.2 (build 14A456), the small update includes multiple bug fixes for iOS 10 on any compatible iPhone or iPad. 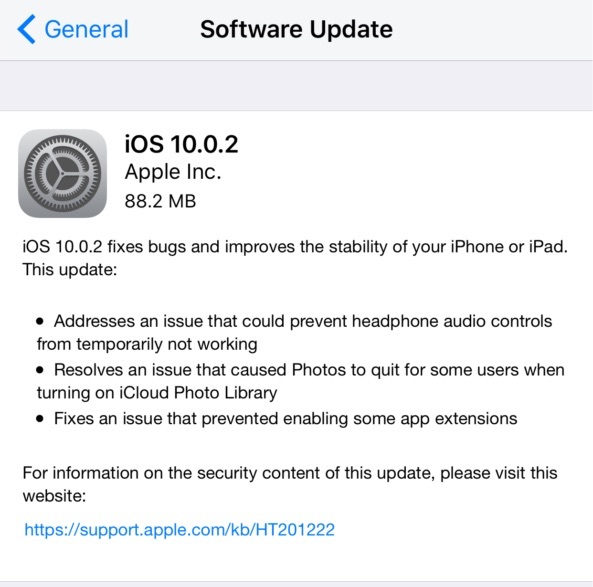 The three primary bugs addressed with iOS 10.0.2 include a fix for headphone audio controls randomly not working, a bug with Photos app and iCloud Photo Library, and a fix for an issue with some app extensions. The small software update is available now to all users who are running iOS 10 or iOS 10.0.1. The easiest way to download the iOS 10.0.2 software update is through the OTA mechanism on the iPhone or iPad itself, accessible from Settings > General > Software Update. It is recommended to backup the iPhone or iPad before updating to iOS 10.0.2, even though it is a small update. Users can also download and install iOS 10.0.2 through iTunes on a Mac or Windows PC. IPSW requires using iTunes to perform a manual software update, you can read about using IPSW files here if interested. Apple is silent for 9 months and then suddenly it’s update everything you own 50 times in a week period. This is exhausting, I feel like I’m spending half of my time updating my iPhone and Mac now. The amount of time I spent doing the latest update was probably less than the time it took you to type in your statement here. Hopefully this fixes the excess battery drain I have experienced since 10.1 came out. iPhone 6s Plus! I have an iPhone 6s, but I have not experienced any battery drain. I find the battery life quite excellent. I also find many of the features of iOS 10 irresistible and really enjoyable. Just today I decided to update my iPad also. I held off until I was sure. I wonder if it would be helpful to check your battery usage settings and see what is consuming your battery. I think I disabled my “news” because I didn’t use it and it seem to be consuming more battery than anything else. Just trying to be helpful. Apple has a really bad habit of turning bluetooth “on” after an update. Right? It’s become the Adobe Flash of cell phones. Updated my iPhone 6s to iOS 10.0.2. Now I can’t open an email. Displays a blank screen when I select an email to read. Any ideas? Same problem. Let me know if you find a fix. I have the same problem, just upgraded my iphone 6s to ios 10.0.2 and I can see my emails in my inbox but if I select an email I get a blank screen. have there been any fixes? I haven’t found anything. I also upgraded my iphone 6s to ios 10.0.2 and I can see my emails in my inbox but if I select an email I get a blank screen. My phone is two months old. The Apple tech did admit that this has occurred to other users and scheduled an appointment with the genius bar. Any assistance is much appreciated. I don’t want to be mean to you guys, but you deserve all these troubles, ya know. Have you not know what Apple is doing by now? Apple screams: “Hey everyone, we farted, ya’ll may come and smell it!” And all these people flocking to smell their fart. Apple could just waited a month, fix bugs and release it. Hell, they could’ve just waited an extra year and release it completely stable. But no. This is what they’ve been doing. And some just can’t stop rushing to smell the fart. I don’t understand… There’s nothing, and I mean absolutely nothing wrong with my nearly 5 year old iPad 3 running 7.1.2. I have no intention to upgrade. Neither my El Crapitan 10.11.6. On my end, I don’t need more bugs. That’s what every software developer is doing, not just Apple. They’ve realized that the best testing is done by their clients and they let them have at it. Software has become so complex that by the time you are finished exhaustively testing everything it is already obsolete, the libraries you’ve used retired and full of security holes. Apparently now hardware is developed the same way too with some spectacular consequences. after the latest update to 10.0.2 the auto lock under Settings General does not show up anymore. More bugs after the update? In Apple’s infinite wisdom, they moved this setting from a perfectly logical place under General to someplace not even Steve Jobs would consider: Displays/Brightness. Now that’s forward thinking. Thanks. The one place I had not checked. After 10.0 update…Apple Pay stopped working. No way to access it at all. I have upgraded my iPhone to the latest IOS and now iTunes on my PC will not recognise my iPhone, I now cannot upload my photos from my iPhone to the PC. I have the same problem. Could not reach my iphone photos via pc. Connection lost via usb. Is it a bug or a feature? Im having the same issue but have no idea how to fix that. me too, any fix yet ? Ditto that. I don’t want to load my pics to iCloud as I live in the boonies and internet is not terrifically reliable. I plug my 5S, iOs 10.0.2, into my Windows 7 PC, using the usb, and I don’t even SEE the phone in the listing of devices plugged into the USB ports. It seems as though Apple is forcing us to use iCloud. Grrrrr – Apple scores again on being control freaks. Any ideas of a work around for this? OR – And idea when the fix will come out? I have the same issue – not able to backup pics etc. Any answers? Have you been able to upload your photos to your PC? I’m having the same problem. A window comes up saying “Photo in the Camera Roll on my iphone cannot be viewed or imported because the iphone is locked with a passcode. You must enter your passcode on the iphone to view or import them.” My phone is not locked and I have the photo album open as I usually do. Does anyone have a clue about what’s going on? I’ve just updated to 10.0.2, and I’m having the same problem with my Windows 7 computer now not seeing my Iphone 6 plus. Has anyone found a fix yet? I downloaded the iOS 10.2 beta tester and everything seems to be working perfectly fine. It even downloads an app so you can send Apple any problems you may find. Skip all the unnecessary updates and go straight to iOS 10.2, I’m sure they already know what bugs to fix and have already fixed them, this is just a way to give people something to look forward to and keep them coming back for more. Just did an upgrade yesterday and excess battery drain I have experienced since 10.1 iPhone 6s Plus! Have to place on charge every two hours. Check to see they didn’t turn on bluetooth after the update, they often do it automatically for no apparent reason. Battery drain since ios10.2 is horrendous- this needs to be sorted!! It’s December 19 and I just upgraded a small thing and NOW have excessive battery drain plus Safari quit working. Also can’t open additional links in my email. What’s going on with Apple upgrades anyway? After 10.1 and continuing after 10.2, I still cannot hear much of a phone conversation, it completely cuts out the other end, often even with bluetooth. So frustrating!! Updating now. Hopefully this fixes the keyboard issue in Safari. Anyone else having the problem when you type and then hit the key to use a number or punctuation and then it doesnt switch back to the letters automatically? I have to manually switch in Safari, but in Messages and other apps it works fine. Still no way to disable voice assist ooo copwhen pressing the home button too long on accident? Sigh! vdiv you are absolutely right. One poster said they upgraded because everyone else was doing it. A true follower at best and that is what the developers are betting you will do and that is what they want you to do. Very very few ever read these post and fewer have their employees read these “attitude” post but they do look for new ideas. At this time the FBI is responsible for policing the Internet for criminal issues. If one feels they are a victim of a violation of a U.S. federal law then go to their website and read. A class action lawsuit that can punish violators monetarily in Federal Court is a possibility. Being smart educated purchasers of software and hardware is the best thing we can do. First world problem but I’m so annoyed after 10.0.2 update. (And I didn’t even want it yet!) Anyone else notice a change on how it now files email? It’s a big part of how I use my phone and now it auto suggests a folder. And the threading email option is atrocious now too! I’ve tried to play with settings to change things but not liking any of those settings. I had to hard restart. I agree: too many updates lately. Apple should unbundle parts of the OS into apps that can be updated without having to update the whole operating system. There’s no need to download an entire operating system to fix a bug with audio controls, photos, or iCloud. Those should all be separate components Apple could push out independently. They need not make those components open to end users but they could keep them separate internally. Only changes to the kernel should require a full-blown update. I updated to 10.0.2 now every time I move my phone the display comes on,why.is this normal,can I change tnis. See the article on “lift to wake”. After the latest update, 10.0.2, my photo app has been stuck with 103 photo scanned and 467 to go. I have locked screen and plugged into power may times with no change. Anyone else still having this issue? Updated to 10.0.2 and hit the wrong button when it asked about updating other devices. My wife updated her phone and had to call me to get a passcode from my phone. Is there a way to turn this feature off so she doesn’t have to get it fro me next time? She about killed me. Thanks Paul. It hit the mark! Hopefully one update will make it where you can arrange everything in the Notification Center again and get to apps from there. All over I don’t really care for the IOS 10 update. Updated to 10.0.2 and now I can’t send multiple photos from my photo albums. Suggestions? Help! I’m having the same problem – can’t send multiple pics. Trouble with ios 10.0.2. Unable to access my ‘notes’. also some games have many faults. I need to reinstall ios 10.0.2. software update says iPhone is up to date. ios 10.0.2 problems. Unable to access ‘notes’. How to reinstall update. Upgraded from iPhone 5s to 7 using iOS 10.0.2. Now I can’t open an email. Displays a blank screen when I select an email to read. I can see list of all emails and emails are sending & receiving however when I open can only see blank screen. This is happening for gmail/exchange/IMAP accounts Any ideas? I have same problem, is this happening to lots of people?I have iPhone SE. Any fixes yet? Same problem here – let me know if there is a solution. Thanks. Can’t send outlook email after 10.0.2 upgrade. Anyone else? I just got my iPhone 7 today and was finished transferring everything for about 5 minutes before launching the iOS update. I walked away for 2 minutes while it started to install. Now my phone is off, not responding to anything and acts completely dead. I’m forced to leave this from my old iPhone. What’s up? Is this normal? After the latest update of IOS 10.0.2, my recent notification had glitch on Notification Center. Anyone else still having this issue? I have iPhone 6 and I’m experiencing terrible battery drain after upgrading to 10.0.2. :-((((What can I do to stop it?? Thank you a lot. My second phone runs Android. I have been running version 4.1 since 2012 without any issues. What is the problem, Apple? Just installed 10.0.2 and now no access to gmail. Any suggestions? Since doing 10.0.2 iphone update, my itunes says I have errors or requires password. WHY? I have the same problem. If you solve it, let me know pls. After updating to 10.0.2 can not access anything google. My e-mail, facebook, even having problems getting into the app store. I am on an iphone 5s any suggestions? Since I upgraded to IOS 10 I cannot play my favorite game, Monopoly. I do not really understand why we go backwards. I remember my iPhone4 and hadnt ever fail. My iPhone 6 Plus is crazy. Please DO SOLVE THE MONOPOLY ISSUE. We pay a license for that.!!!! There’s no sound when I play my games on my phone. What’s up with that? Can anyone explain why? I highly suggest you do not make the upgrade! I have always trusted Apple’s software updates, but this one is a complete strikeout. They whiffed on this one. My iPhone 6 is unable to connect to Image Capture (the application for downloading pictures/videos onto my computer for editing, etc.) nor can it connect to iTunes! Image Capture tells me to “Unlock” the device (which it is) and iTunes gives me a error message window that says “iTunes could not connect to the iPhone because an invalid response was received from the device.” Arg! This is extremely frustrating. Hey Apple – PLEASE FIX THIS ASAP! I WANT MY USAGE BACK! I have the same problem. It’s maddening. I reset network settings, shut down my mac, restarted iTunes and image capture, etc. Any fixes? Thanks. YES!! So annoying! WHY won’t it connect to iTunes or iPhoto??? I am ready to throw my phone at the wall if I get one more of those stupid messages saying my phone is locked with a passcode or saying that an invalid response was received from device … When clearly it is unlocked. If anyone has any fixes would be greatly appreciated. Fix this already Apple! Does anyone else on here have good sound after downloading this update? I have an iPhone 6S running iOS 10.0.2 which was installed on 1/10/2016. Ever since the update, my phone freezes half way through typing. This means I have to reboot it which I have done about 100,000 times since I installed the new software. After much research, and a logical process of elimination, I have discovered that there is an incompatibility issue with iOS 10.0.2 and Microsoft Exchange which is installed on my iPhone. I use Microsoft Exchange to access my: outlook, contacts and calendars on my phone from my Microsoft computer. Has anyone experienced this problem and does anyone know how to fix the problem? After latest iOS 10.0.2 update, I can no longer download/save my jpg files from my email to my phone. Updated iPhone 5 to 10.0.2 and now it won’t sync or upload photos to MacBook. These are the two messages that come up when I plug the phone into my MacBook: “iTunes could not connect to the iPhone because an invalid response was received from the device.”, “Photos in the Camera Roll on iPhone cannot be viewed or imported because the iPhone is locked with a passcode.” I did enter the passcode. Any advice on how to fix would be much appreciated. Did you update iTunes on the Mac to the latest version? Sometimes iTunes needs to be updated to a newer version to support iTunes syncing, you might also want to try a different USB port on the Mac or a different USB cable. What version of Mac OS software is it? I have two different iphone 5’s. One is through ATT and the other is through Verizon. I did the 10.0.2 update and the ATT phone is fine, but on the Verizon phone, safari won’t load. Verizon appears to be in denial of the issue. Also have an Ipad through Verizon and safari will not work on it either. Now I can’t access music and podcasts with “E” explicit language. Running iOS 10.0.2 (updated 01 Oct) and have Win 7×64 desktop. Lately, when plugged into a USB port, iTunes runs and syncs fine, but the phone doesn’t pop up Windows Explorer so I can’t get at photos. Anybody have a similar experience? I thought it had worked since the 10.0.2 update, but hadn’t shot any pictures to download so am not 100% sure. A friend has seen similar behavior. I just updated to 10.0.2 from the previous version. Now I can not upload a picture to a DM box in instagram as I was able to do before. Anyone with same problem? Fixes? After reading this column I regret updating. Is there a way to rollback? Apple should offer a roolback option when they mess up things so royally. Ok this latest update???? Simone needs to be shot! 2X in 24 hours my phone wipes. I hate you people!!!!!!! Updated my iphone 6+ to ios 10.02 now i can’t sync my iphone to my itunes or iphoto as my Mac doesn’t recognize it! This is so frustrating has anyone been able to fix this problem? Why my iPhone 6 didn’t get the iOS 10.2 update ? My iPhone 6 Plus is updated to 10.1.1 & says this is fully up to date? I’m also having issues with it not importing my photos! Says it’s locked with a passcode? Hello everyone , I have a same issue regarding after updation of 10.0.2 , don’t open email , import pics problem and blue tooth problem. Please provide a solution to solve the problem . Since updating to iOS 10.2 on my iPhone 5s last night, now whenever I rotate my phone to landscape mode for Gmail or Blood and Honor my iPhone starts to flicker between a black screen and the application. For some reason, it seems to do this more when I rotate the phone to where the volume controls are in the upper-right-hand corner. But it happens in either landscape orientation. I have not dropped my phone and it did not do this prior to the 10.2 upgrade. I have submitted this information to Apple. Driving the kids mad at home.